UPDATE: How the commission members voters and link to previous Portland Tribune story now included. 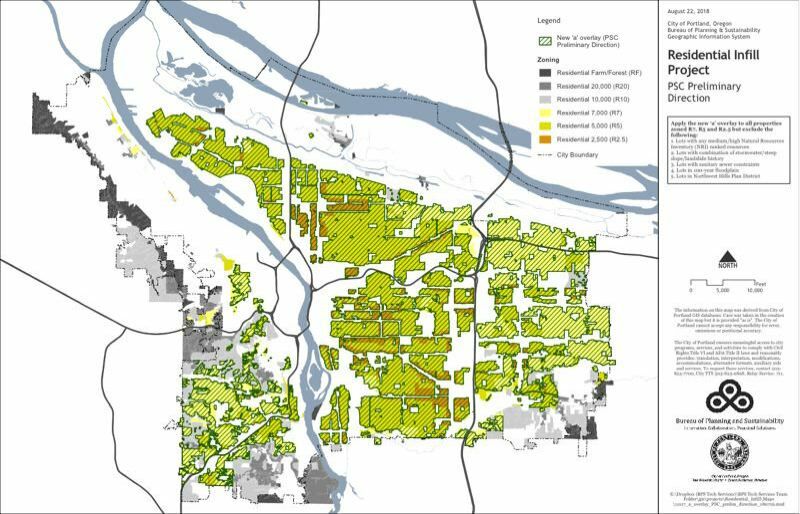 In a surprisingly close vote, Portland's appointed Planning and Sustainability Commission approved the current recommendations of the Residential Infill Project last week. The 5-4 vote sends the controversial proposal to rezone 93 percent of the city's single-family neighborhoods for up to four housing units on most residential lots to the City Council for consideration this summer. The one-vote margin caught many observers off guard because the commission had requested the most recent recommendations in a series of work sessions, and many members had cheered a private economics report that predicted they would create 24,000 additional housing units over 20 years. Supporters said they are needed to help accommodate the 123,000 additional households expected in the region by then. But two things happened shortly before the vote that raised concerns. First, the Bureau of Planning and Sustainability, which is staffing the project, released a displacement study that said the additional units would not be distributed equally throughout the city, but would be concentrated in lower-income neighborhoods where residents are at risk of being priced out. The Portland Tribune was the first to report on the study. "We're going to displace people, and the anti-displacement plan seems like a feel-good plan to me," said Commissioner André Baugh. "RIP is a displacement plan." Second, on the day of the hearing, The Oregonian reported the displacement study only estimates that 4,000 additional housing units would be built — and that the much lower number was not publicly released, but had to be unearthed with a public records request. The staff explained their report used different, more restrictive construction assumptions than an earlier economic study. They said both figures should be read together to show the possible range of the additional units. "I didn't know until I read The Oregonian that there was more than one set of data I was basing my opinion on," said Commissioner Katie Larsell. Both issues were discussed at length during the meeting. In the end, Commission Chair Katherine Schultz said she believes the recommendations will reduce displacement and lower rents. Voting "yes" were Schultz, Vice Chair Chris Smith, Ben Bortolazzo, Mike Houck and Eli Spevak. Voting "no" were Baugh, Larsell, Daisy Quiñonez and Teresa St. Martin. Although the recommendations eventually were approved by the thinnest of margins, ending the commission's role in the lengthy project, those voting "no" said they want the council member to address their concerns when they take it up in coming months. A letter urging the council to address the displacement issue will be written to accompany the project recommendations to the council. You can read the Portland Tribune story on the displacement study at www.tinyurl.com/y6h8o2m2.